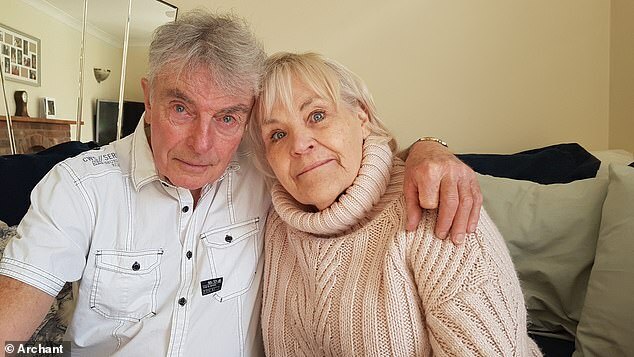 A 70-year-old woman was forced to wait almost eight agonising hours for an ambulance after breaking her hip at her home. Susan Key, who has terminal lung cancer and multiple sclerosis, lives just ten minutes away from the hospital. But medics didn’t arrive at her home, in Ipswich, Suffolk, until the evening of the initial phonecall at 10.32am. At this point, Ms Key was suffering chest pains and had called emergency services five more times, as well as her GP who urged immediate action. The shocking story comes just days after figures revealed people needing urgent care in rural areas are having to wait up to 20 minutes for an ambulance. In Suffolk Coastal, the average wait is over 17 minutes – six more than the rural average. But on February 1 when Ms Key had her fall – the wait was almost a whole day. Ms Key slipped in her shower room, and with her foot against one wall and her back against another, she cried out for help. Thankfully her son’s girlfriend was with her and called an ambulance at 10.32am. But medics didn’t arrive at her home in Ipswich, Suffolk, until after 6.30pm that evening. Mrs Key, who also suffers from multiple sclerosis, had not taken medication for her condition that day, resulting in ‘uncontrollable jerking motions’ in her body, making her pain infinitely worse. At around 1pm Mrs Key’s friend called her GP who told her to take some painkillers and to sip water. The doctor even called the ambulance service themselves, urging them to help Mrs Key more swiftly. Hours after her fall, after a further four calls to the ambulance service, Mrs Key started experiencing chest pains. Mrs Key’s son, Adam Tibbenham, called for a fifth time, pleading the emergency services to come quicker. He said Mrs Key was upgraded in priority by the control room, but it was another two hours before an ambulance arrived. NHS England introduced guidelines in 2017, known as the Ambulance Response Programme, which categorises phonecalls into how serious they are. Category one, for life-threatening injuries and illnesses, specifically cardiac arrest, should be responded to in an average time of seven minutes, whereas category four, for vomiting or back pain for example, are usually responded to within 180 minutes. 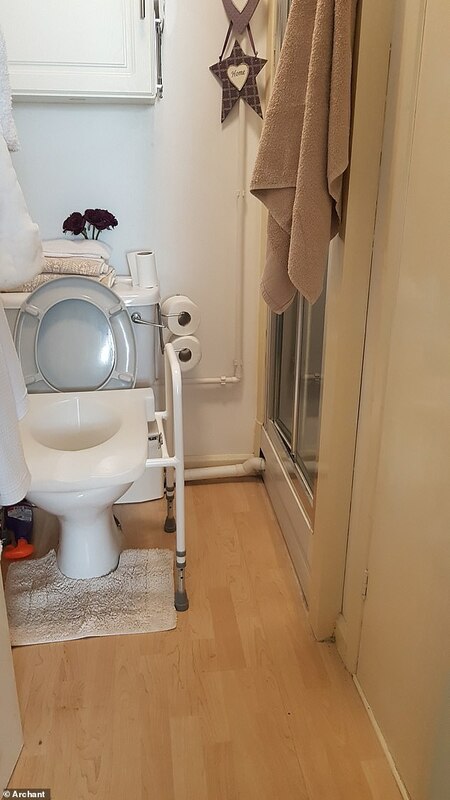 Mrs Key said: ‘I couldn’t move because of my broken hip plus I find it difficult to get up anyway because of my MS.
‘My legs started going into spasms. By the end of the day I was screaming out in agony. The East of England Ambulance service said it ‘deeply regrets’ Mrs Key’s long wait for help. A spokesman said: ‘We can confirm that on February 1 we received a 999 call from a patient who had broken her hip after a fall at home in Ipswich. ‘We were extremely busy on February 1 and it is necessary to prioritise patients with life-threatening injuries and illnesses. Patients with life-threatening emergencies in rural parts of Britain face waits of 20 minutes for an ambulance, figures have revealed. Wells-next-the-Sea in Norfolk, home to around 2,000 people, has an average wait of 21 minutes and four seconds for an emergency ambulance. Local MP Norman Lamb, a former Lib Dem leadership candidate, has accused the local ambulance trust of ‘consistently failing’. 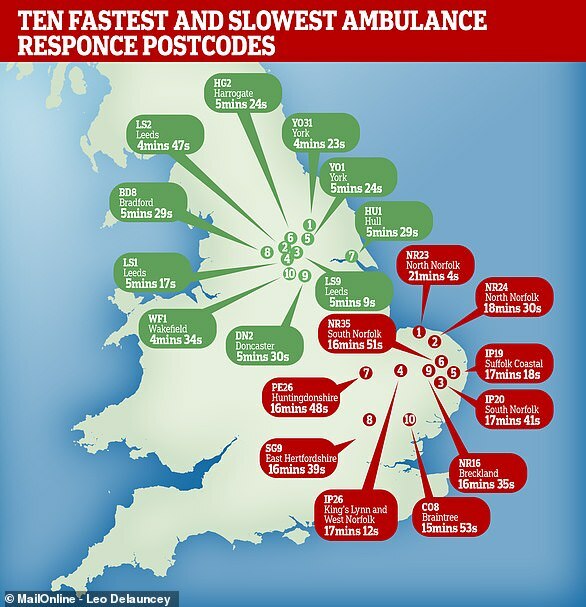 The wait in Wells-next-the-Sea is almost twice as long as the national average for rural areas, which can usually expect an ambulance in 11 minutes 13 seconds. Ambulance response figures analysed by the BBC have revealed the NR23 postcode in North Norfolk has the slowest call-out time. On average, rural areas in England have to wait 11 minutes for a response if they have a medical emergency such as a heart attack or difficulty breathing. The NHS figures used by the BBC cover January to October last year and are based on response times to the highest priority health emergencies. These include heart attacks, seizures, giving birth, major blood loss, stab injuries and people unable to breathe. Only around one in every 20 999 calls are this serious and they are prioritised because of the risk of the patient dying.